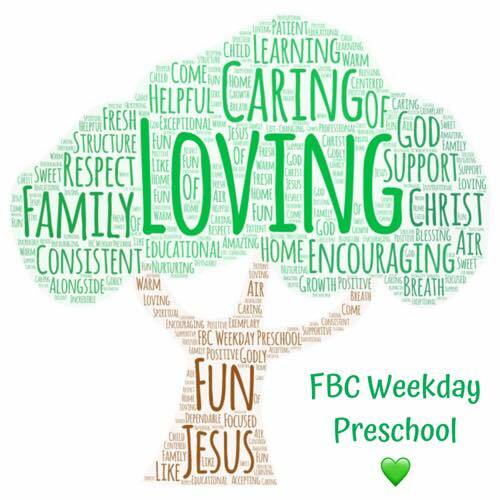 At First Baptist Church Preschool, we provide opportunities for children, ages 2 to 5, to grow according to individual needs through a structured schedule that balances the spiritual, academic, social, and physical aspects of development. Our curriculum includes opportunities for a variety of experiences. Children are exposed to Christ-centered lessons, colors, numbers, letters, shapes, and calendar time, in addition to art activities, Biblical lessons, outside time and more. Each day children have time to develop their large and small motor skills, communications skills and social interaction skills. We are committed to quality Christian child development. All classes have a lead and assistant teacher. The teacher/student ratio is 1:4 for 2's, 1:6 for 3's, 1:9 for the 4's and 1:5 for the TK program. Children will be placed in classes based on their age as of August 31. For more information, please contact Jennifer Trull, Director: 704-283-8534 or jtrull@fbcmonroenc.com . Email address effective May 26, 2016.